Winner of five 1960 ACADEMY AWARDS®, including Best Picture, The Apartment is legendary director Billy Wilder at his most scathing and satirical best. With audio commentary from film producer and AFI member Bruce Block and two featurettes— including a loving tribute to actor Jack Lemmon—this special Collector’s Edition is your chance to own one of "the finest comedies Hollywood has turned out" (Newsweek)! C.C. Baxter (Lemmon) knows the way to success in business...it's through the door of his apartment! By providing a perfect hideaway for philandering bosses, the ambitious young employee reaps a series of undeserved promotions. But when Bud lends the key to big boss J.D. Sheldrake (Fred MacMurray), he not only advances his career, but his own love life as well. 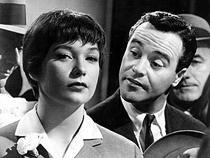 For Sheldrake's mistress is the lovely Fran Kubelik (Shirley MacLaine), elevator girl and angel of Bud's dreams. Convinced that he is the only man for Fran, Bud must make the most important executive decision of his career: lose the girl...or his job. Getting ahead in life can be rather difficult. With the business world seemingly rigged, many desperate individuals will try just about anything to catch a break or find a leg up, leading to some pretty creative strategies. The protagonist of Billy Wilder's 'The Apartment,' is one such desperate, but crafty individual, and in order to climb the professional ladder he resorts to some decidedly out-of-the-box thinking. A masterful blend of comedy and pathos, the movie presents a charming, entertaining tale of romance that isn't afraid to tread into some surprisingly dark subject matter. Led by Jack Lemmon's effortless, everyman charisma, and Shirley MacLaine's heartbreaking allure, the film easily stands the test of time, putting most, similar modern efforts to shame. C. C. Baxter (Jack Lemmon) is a low level employee at a big insurance company who dreams of rising to the top of the corporate world. In order to make his ambitions a reality, he has devised a devious little scheme to win over the good graces of his superiors, by letting his bosses use his apartment for their various adulterous affairs. The plan works like a charm, and soon Baxter is invited to meet with the company's head honcho, Jeff D. Sheldrake (Fred MacMurray). It turns out Sheldrake wants to utilize Baxter's unique services as well, and not wanting to pass up the potential for a big promotion, he seizes the opportunity. Unfortunately, the situation takes a dramatic turn when Baxter discovers that Sheldrake's romantic partner is none other than the building's lovable elevator attendant, Fran Kubelik (Shirley MacLaine). After he develops feelings for Ms. Kubelik, Baxter begins to rethink his strategies, and must ultimately choose between business and love. The true genius of the film revolves around its perfect mixture of comedy and drama. The main plot features a delightfully subversive sense of humor that presents a cynical satire on corporate America. Highly influenced by the great Ernst Lubitsch, Wilder gives his characters playful, unique personalities and biting, memorable lines of dialogue. In sharp contrast to many modern comedies, the humor is given time to develop and breath, with Wilder often lingering on shots, letting Lemmon draw out and build extra bits of amusement. While all of the comedy works brilliantly throughout, the movie actually takes a very dark turn at its half way point, and somehow Wilder is able to balance the tones without skipping a beat. In fact, not only does the drama not end up clashing with the comedy, it actually turns out to be incredibly effective and powerful. A certain downtrodden malaise casts over the second half, showering the proceedings in a sobering mist that draws some very realistic characterizations while still maintaining an ultimately life affirming charm. It's a truly remarkable juggling act, and Wilder makes it all seem so easy. One particular scene becomes a great example of the movie's oscillating, but perfectly harmonious tones. At an office Christmas party, Ms. Kubelik is given some bad news about her precarious relationship with Sheldrake. Depressed and somber, she runs into Baxter who enthusiastically shows her his brand new office. Baxter carries on, trying on a silly hat with a playful smile while acting like a giddy fool. All the while, Kubelik continues to wallow in sadness on the complete opposite end of the emotional spectrum. The manner in which the dialogue and interactions are written and performed almost makes it seem like the characters are in two completely different movies -- Lemmon appears to be in a lighthearted comedy and MacLaine is clearly in a drama -- but somehow they come together, and it works beautifully. In the included special features, it's revealed that the director feared Baxter might prove unlikeable to audiences, but honestly I'm not really sure what Wilder was worried about. It's nearly impossible for Jack Lemmon to seem unlikeable, and as Baxter the actor absolutely wins over viewers. The character is a classic lovable loser, a lonely "schnook" with a good heart that makes some poor decisions. Lemmon plays up all the right comedic and dramatic beats, and demonstrates a great talent for physical comedy. As memorable as the actor is, MacLaine might actually be the real scene stealer. Her performance as Fran Kubelik is irresistible and touching. Her sadness is palpable, and MacLaine underplays the emotions with heartbreaking restraint, revealing devastating bits of anger and sorrow through simple glances and fleeting lines of dialogue. The pair have incredible chemistry and make for one of cinema's most lovable on screen couples. Wilder injects a surprisingly strong visual style into the proceedings. Opting for a wide, 2.35:1 aspect ratio, the director often uses the full scope of the frame. Character placement and blocking take advantage of the added space, enhancing bits of drama and comedy. There is a great economy of shots on display as well, with the director choosing to cut to new angles only when functionally necessary or dramatically important. Many scenes feature relatively long takes with wide masters. The film is home to stark, noir influenced lighting, which helps to set it apart from typical comedies, bolstering the narrative's unique blend of tones. Production design is also top notch, with some inventive forced perspective set construction used to exaggerate the business world's dehumanizing grip. In addition, the apartment itself takes on a life of its own, becoming a cozy retreat from the movie's harsh corporate environment. 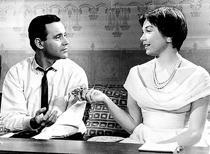 'The Apartment' is a true classic, a perfectly balanced masterpiece that celebrates love's joys and heartaches with wit and insight. The film has inspired many imitators and has become the prototypical romantic dramedy that all subsequent releases aspire to be. Truly ahead of its time, the movie actually feels fresher today than the majority of its numerous modern copycats. Through the story of lonely schlub, C.C. Baxter, Billy Wilder tells the tale of a simple "schnook" who learns how to be a real "mensch," illuminating all of the cynical and heartwarming realities of life along the way. 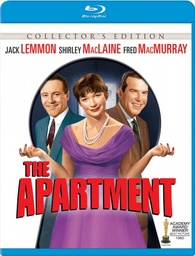 MGM presents 'The Apartment' on a BD-50 disc housed in a keepcase. Some logos and warnings play upon start-up before transitioning straight into the film, forgoing a traditional menu. The packaging indicates that the release is region A compatible. The movie is provided with a black and white 1080p/AVC MPEG-4 transfer in the 2.35:1 aspect ratio. Authentic to the filmmakers' intentions, this is a wonderful, nicely preserved transfer. The print is in fantastic shape, but there are some very minor specks here and there (mostly in the opening shots). A light layer of grain is visible throughout giving the image a pleasing, natural filmic quality. Clarity is good, revealing all of the little, painstaking production details. Wilder utilizes the widescreen frame to its full advantage, and the transfer does a nice job of showcasing his understated, economical, but still artful compositions with nice instances of depth. With that said, wide shots do look a tad soft. Contrast is nice and high, featuring bright whites that pop and deep, inky blacks that really show off the film's noir influenced lighting design. Some very mild edge enhancement pops up in a few scenes, but doesn't hurt the presentation. 'The Apartment' shines nicely on Blu-ray in a faithful, consistent transfer. With very little signs of damage or age, the image carries a clean, mostly pristine look throughout that should more than please fans. The film is provided with an English DTS-HD Master Audio 5.1 track along with Spanish and French mono tracks. Subtitle options include English SDH, French, and Spanish. Resisting the urge to spruce up the original mono elements too much, this is a respectful remix that does the film justice. Dialogue is clear and full throughout with no signs of crackle or hiss. The soundstage remains faithful to the movie's mono roots but has been opened up slightly in subtle but effective ways. Speech and other effects are occasionally spread out directionally when appropriate, and soft echoes of music and ambient sounds hit the rear speakers. The wonderful score comes through with nice fidelity demonstrating pleasing range with no distortion. Low end activity is minimal, but for a movie of this type that is to be expected. Balance between all of the audio elements is handled well. While I usually prefer for mono films to retain their original track, this 5.1 remix is so subtle and unobtrusive that I didn't mind it at all. With no major signs of age or distortion, this is a very solid track. MGM has compiled a nice but relatively slim collection of supplements. All of the special features are presented in standard definition with Dolby Digital 2.0 audio. Audio Commentary from Film Producer and Historian Bruce Block - Block provides an informative and steady discussion of the movie, rife with production trivia and facts. Various details on the film's locations, casting, schedule, production design, and visual style are all touched upon. Block also describes several scenes that were cut from the final edit and even reads a few excerpts from the original script, demonstrating how close the finished product stays to the writers' detailed descriptions. Some background information on Billy Wilder is thrown in, including talk about his love for Ernst Lubitsch films and their heavy influence on his work. Though Block does repeat himself a bit throughout, this is a pretty strong commentary that fans should definitely check out. Inside the Apartment (SD, 30 min) - This is an interesting look back at the film's production, featuring interviews with some of the cast and crew. Billy Wilder's path to Hollywood is discussed along with details on the inspirations for the movie's risqué subject matter. Participants touch upon the film's innovative mixture of tones and share various anecdotes from the set. 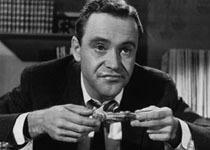 Magic Time: The Art of Jack Lemmon (SD, 13 min) - Here the focus is on actor Jack Lemmon. Interviews with his son (who looks and sounds a lot like him) and biographer are included, sharing lots of details on his life and approach to acting. Theatrical Trailer (HD, 2 min) - The theatrical trailer is included in 1080p. 'The Apartment' is a genuine masterpiece, a rare film that perfectly marries humor and drama into a beautifully insightful and entertaining package. By blending somber pathos, biting satire, and lighthearted charm, Billy Wilder ends up with a truly unique piece of cinema that was way ahead of its time. The video transfer is strong, remaining faithful to the filmmaker's intentions, and though it's a mostly unnecessary remix, the new 5.1 track does the movie justice. The special features aren't exactly mind blowing, but the commentary and featurettes are a very welcomed inclusion. Basically, this is a wonderful disc for a really special movie. Highly Recommended.